Turmeric (Curcuma longa) is a medicinal plant of the family Zingiberaceae widely growing throughout India. Turmeric oil issecondary metabolite of turmeric and obtained by steam distillation of its rhizomes. Turmeric oil chiefly comprises arturmerone and β-turmerone. During more recent decades broad spectrums of therapeutically interesting pharmacological properties of turmeric and its secondary metabolites have been reported. 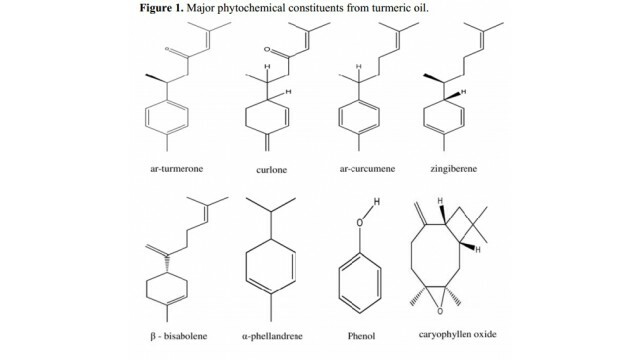 Recent several efforts made to explore the pharmacological profile and mechanism of action of turmeric revealed exceptionally broad spectrums of pharmacological activity profiles of turmeric oil. It is now well recognized that additive or synergistic interactions between diverse combinations of phytochemicals are involved in health benefits of vegetarian diets and herbal remedies and that regular consumption of appropriate combinations of some such edible phytochemicals with every day meals could as well be used for prevention and cure of different health problems. Critical analysis of available preclinical and clinical information on turmeric oil strongly suggests it is pharmacologically polyvalent and possess several pharmacological properties. Aim of this communication is to summarize and critically analyze such data, and to point out some possibilities for more rationally exploiting their therapeutic potential for discovering novel therapeutic leads, or for obtaining pharmacologically better standardized phyto-pharmaceuticals.